In the garden, German Statice stays low to the ground until it starts to bloom. 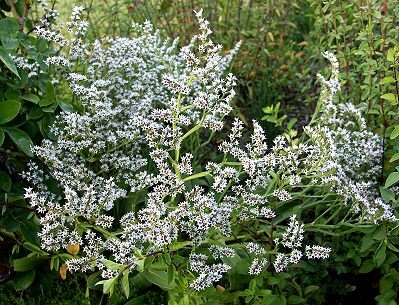 The broad leaves, which are obscured in the picture above by the white flowers, do make a nice textural ground cover. It isn't something that you want to walk on though. The graceful white drape of dried German Satice sets off the vivid pink of Marshall's Memory Oregano in the picture below. 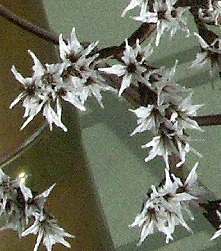 The stark white flowers (actually the bracts of the flowers) of German Statice can be cut in sprays and arranged fresh as they were below or dried separately for use later in arrangements. 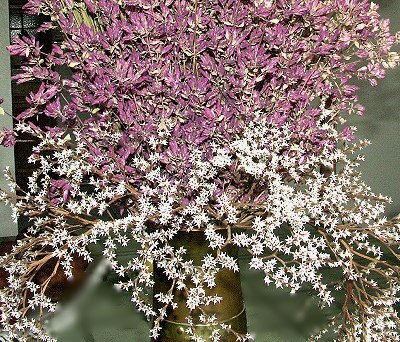 German Statice makes a great addition to our Crafter's Herb Garden Six Pack.